TOKYO, Japan – World eight-division boxing champion and Sarangani Rep. Manny Pacquiao has travelled all the way from General Santos City to Tokyo to help boost the country’s bid to host the 2019 FIBA World Cup. The Samahang Basketbol ng Pilipinas (SBP) headed by Manuel V. Pangilinan invited Pacquiao to be with the Philippine delegation during the scheduled FIBA meeting slated August 7 here. Pacquiao was accompanied by his wife, Sarangani vice governor Jinkee and her two elder sisters, and some members of Team Pacquiao. Aside from being a boxer and lawmaker, Pacquiao is also the head coach of KIA Team in the Philippine Basketball Association (PBA). “I am here to support our country’s bid. You know, basketball is the most popular sport in our country. Halos bawat sulok ng kahit liblib na barangay ay mayroong basketball court. Ganun kalapit sa puso ng mga Pilipino ang larong basketball. 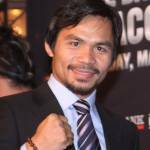 Kaya sana tayo ang manalong host,” Pacquiao said. Another bidder is the powerhouse China. But Pacquiao is optimistic Philippines is a strong contender. “Palagay ko hindi lang naman ang infrastructure o venue and titingnan at ikokonsidera ng FIBA Central Board kundi ang pangkalahatang kakayahan ng isang host. Mas passionate ang mga Pinoy pagdating sa larong basketball,” Pacquiao said. The boxer-lawmaker also cited Filipino hospitality as a big plus factor in our bid to host the FIBA event. “Very hospitable tayong mga Pinoy. Masarap at inspired maglaro ang mga players lalo na pag very hospitable ang host,” Pacquiao said. A final decision is expected to be announced by FIBA’s Central Board after the Friday meeting here. The day before the FIBA meeting, Pacquiao was expected to meet with the representatives of Filipino community here. “I would like to meet and hear the sentiments of our Overseas Filipino Workers in Tokyo. This is part of my job as lawmaker,” Pacquiao, who is the vice chair of the House Committee on Overseas Workers Affairs (OWA), added. Pacquiao and his entourage was scheduled to travel back to Manila on Saturday evening.